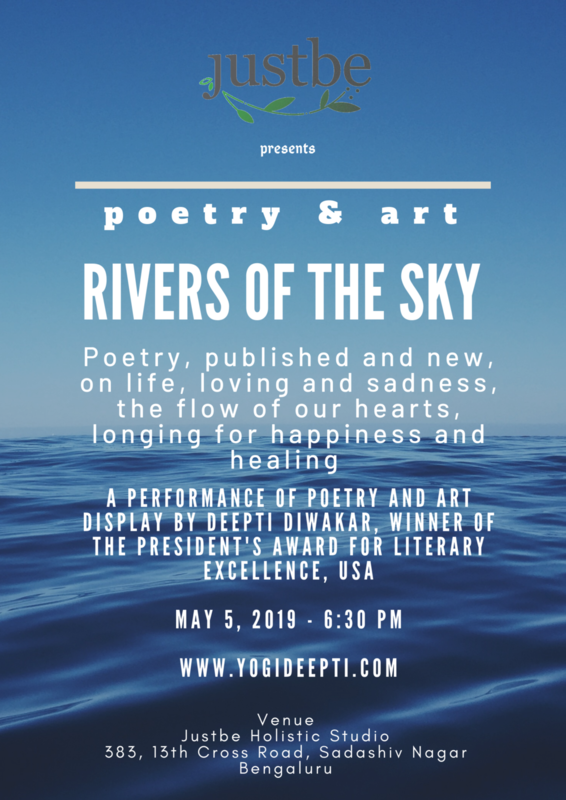 Justbe invites you to a performance of poetry and art display by Deepti Diwakar, winner of the President’s Award for Literary Excellence, USA. Poetry, published and new, on life, loving and sadness, the flow of our hearts, longing for happiness and healing. Deepti Diwakar has been writing poems since early childhood. She grew up in Sadashiv Nagar and reads her poems on Mother Earth, healing human hearts, peace, the aspirations of humans for the freedom of the skies, our rivers of love inspired by life itself. Deepti is a former Miss India World, a Bharatnatyam dancer and author of two books. She also teaches meditation and is an astro-psychic and a palm reader.